The SQALE Definition Document has been downloaded over 10,000 times! The SQALE method just passed an important milestone. Indeed, since the launch of the method on the sqale.org site in August 2010, over 10,000 people have downloaded the definition document. This is quite impressive in regards of the technical (and tedious) nature of the document. Of the 22,000 site visitors, nearly half of them have downloaded this document. It’s impossible to know the exact number of current users. The method is now supported in the open-source version of SonarQube (the most used static analysis tool according to a recent survey. Today, hundreds of thousands of developers monitor some SQALE indicators in their daily quality dashboard. This makes SQALE the number one method for managing technical debt. The SQALE Method is used worldwide, but it is impossible to know exactly the geographical distribution of the current users. The geographical distribution of the site visitors may quite well represent the user distribution. From the sqale.org web statistics, the majority of visitors are located in the USA. 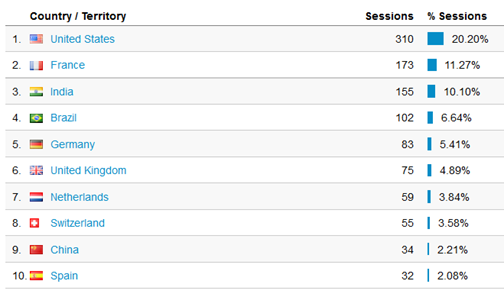 The table below shows the detailed distribution of the site visitors during the last month.